Plenty of parking for large groups and recreational vehicles. May-November: 3 or more night rentals receive $100 per night voucher for Epic Recreation rentals! December-April: Promotional discounts as advertised on website under "Specials" tab. Text or Call Cassidy at 435-799-4645 to arrange your private beach party during your stay! Catering options - there must be food involved right?! Enjoy the sunset over the lake against the gorgeous east mountains. Doesn't get better than that. MUSIC! - What's a party without some jammin'? With 19 exquisitely finished bedrooms, 19.5 bathrooms, and 2 fully stocked kitchens with an additional butler’s kitchen, the Sunrise Resort at Harbor Village is equipped to accommodate up to 100 people in top-quality comfort with the best entertainment and amenities available. 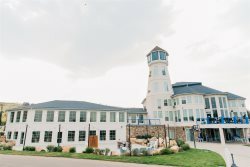 Completely renovated in 2014, this stunning nautical-themed lighthouse resort is an ideal location for weddings, corporate retreats, and large family reunions. The Sunrise Resort includes an expansive furnished dining room, a large game loft with ping-pong and billiards, a 45-seat theater room, exercise facilities, a butler’s pantry, additional folding tables and chairs, and countless other details that will ensure the success of your event. Aside from a grand design, immense indoor spaces, and gorgeous finishes, the Sunrise features stunning views of the lake through floor-to-ceiling windows on every level and even includes a one-of-a-kind romantic honeymoon suite in the lighthouse tower with a 360-degree viewing room at the top. When you and your guests are ready for some time outside, enjoy the large deck and private lawn, have a swim in Harbor Village’s outdoor pool, or take advantage of the on-site tennis courts or basketball hoop. Visit the Sunrise Resort and experience Bear Lake on an exciting new level. Sophia was wonderful. No complaints. They watered the back lawn Monday night and turned lawn into a mud soup. Everything else was great. Our son mentioned that even with 72 of us it never felt crowded. Good insulation. Sophia was always available to help us out! She responded promptly and was happy to help make our experience perfect. She was gracious and didn't seem to be bothered by our calls and questions. She helped with many little details that really made our stay fabulous. We LOVED everything! This place had so many small details that help out our large family/group. Excellent floor plan. Open gathering place was fabulous. Private rooms for quiet and privacy. Bathrooms in each room was excellent. Resort is very clean, well organized, and updated. The kitchen is very well stocked. A lot of refrigerator space. Loved the double freezers, and the ice machine was very helpful. Sound system needed some tweaking, but the portable was perfect. View was incredible. Game room was a hit! WE LOVED EVERYTHING! We will definitely be back!! Great job. Very responsive to any issues. We have been to many locations over the past years. Your facility measures up to our high standards. Responsive. Able to solve problems. We loved working with Sophia, she was responsive, courteous, professional, and explained the expectations and what was available to us quite well. We loved the property, there were no complaints from our family. We loved the space! It was clean and tastefully decorated. The kitchen was fully stocked. We had clean bathrooms in each room that were fully stocked as well. The kids had plenty of space and a great environment to play in while the adults were able to relax and enjoy each other. We are coming back again! Love that we can all be together in one big place! Loved the $400 we used at Epic to rent kayaks and water tramp. Some room were too warm. Individual air conditioners would have been welcome. It was great that we could all meet together in one room for dining and entertainment. They were responsive to every question or need very quickly! The refrigerator space and food storage space were the only things that need improvement. Everything else was fantastic! See below.